As easy as 1-2-3! Complete the form below and an SSI representative will contact you. 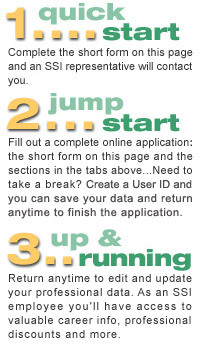 Or jump start the application process by completing an online application. Start now, save your data, and finish anytime! Classification/Specialty: * You may select up to 3 specialties. Hold the CTRL key and click to select multiple specialties. *Please click Save & Continue once and wait for the submission to process. This could take as long as 30 seconds.